In a new unabridged edition of the classic eighteenth-century treatise on the principles of political economics, first published in 1776, the author provides a detailed description and analysis of the inner workings of a market economy, presenting the fundamental principles of a capitalist system. Reprint. Start reading The Wealth of Nations (Pilgrim Classics Annotated) on your Kindle in under a minute. 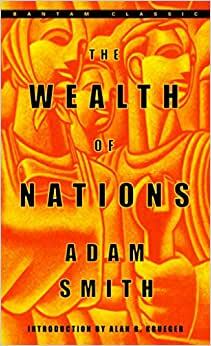 It is symbolic that Adam Smith's masterpiece of economic analysis, The Wealth of Nations, was first published in 1776, the same year as the "Declaration of Independence. The result of Smith's efforts is a witty, highly readable work of genius filled with prescient theories that form the basis of a thriving capitalist system. This unabridged edition offers the modern reader a fresh look at a timeless and seminal work that revolutionized the way governments and individuals view the creation and dispersion of wealth--and that continues to influence our economy right up to the present day. 5.0 out of 5 starsG.O.A.T. I am an avid reader and I have to say, this is the greatest book I've ever read. This book holds the keys to national prosperity. It's almost unfathomable to me that one book can teach so much. You will learn about what an economy is, trade, wages, banking, monetary policy, taxes, public debts, agriculture, history, the list goes on and on. Now a review of this specific edition: The font is quite small which makes it hard to read. This is especially a consideration for a 586 page book. I suggest finding another (rather than this Simon & Brown). I should have read the description closer, but this is not a complete edition of the work. This is only one book of 5, so about 20% of the total text. As to the quality of it with this in mind, terrible. The type chosen is small and not attractive looking. If your eyesight it poor it will be hard to read. You can download the work for free many places on the internet. I prefer to have a physical book, but after this I will be much more careful in the future. In summary, this is basically a scam and a money grab. Do yourself a favor and don't order this. You're welcome. 5.0 out of 5 starsAs timely today as when it was written in the 1770's. I have read Wealth of Nations a couple of times and decided to download a copy to my phone so I can have it on hand always. Saying that, I still feel if you want to know how we (the middle class) got in such a financial quandary nowadays, I say go back to the best tutorial ever written, (so far). Adam Smith's insight into the business man's mind is as point on today as it was in the 1700's. He warned us then, what is happening now; fiat money, collusion, government favoritism, etc. Problem is, people would have to pick up a book and read about the darker side of the business world and the effect it has on the 'consumer', 'citizen', and 'environment'. It is difficult to influence a population with one book; when the population is bombarded 24/7 with business propaganda. As Smith says, "I have never known much good done by those who affected to trade for the public good." Today, I watch with amazement as every industry, (oil, auto industry, agri-business, etc. ), advertise how 'green' and 'pro-consumer' they are. One star only because the book was received damaged. The front page was torn at the spine - most of the way. For the price it is not worth returning, so I will get some glue and try to glue it back together. The Wealth of Nations by Adam Smith is truly an epic classic in our time. This 1000+page is obviously not that easy to read. (Especially in the part that he discusses Silver, etc.) Some of the ideas are ones that we've become very familiar with in our modern lives, not only in the field of economics, but also in politics, religion, law, and finance. Particularly interesting were his thesis on "Division of Labor"(page 15), rules of market place based on self interest(page 23-24), description of banking crisis (page 395), free trade (page 572, with the famous "invisible hand"), property rights (page 684), description of Founding Fathers in US (page 790), free market principle (page 873), rule of law (page 901, 1157), role of government (page 919), human nature and incentives (page 965), freedom of religion (page 1000-1001), progressive tax system (page 1065), government debt (page 1171), currency devaluation (page 1185). I would recommend it to anyone who has the will and time to peruse this superb volume.